It's about time! Beyonce won the 2016 CFDA Fashion Icon Award. The singer and style superstar made an appearance at the event in NYC last night, June 6, to accept this long-deserved honor, which the impeccably-dressed FLOTUS Michelle Obama was also rumored to be up for. 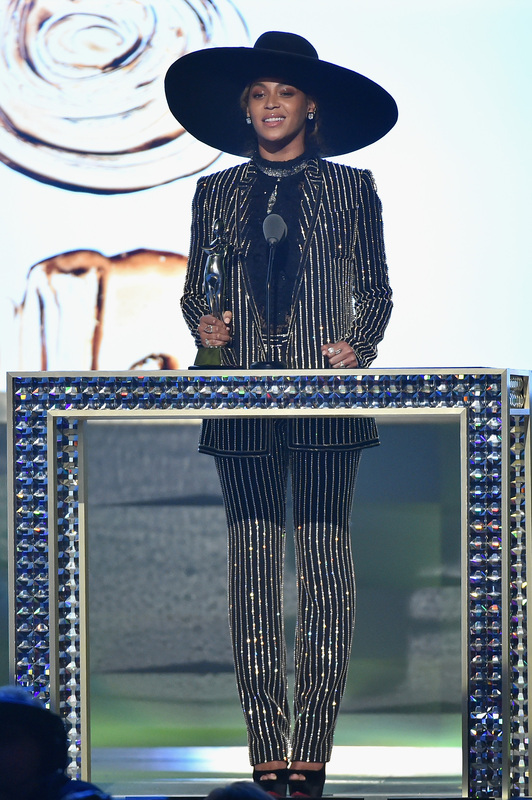 The singer looked absolutely fabulous in a sparkling, black and silver-striped Givenchy pantsuit and a huge-brimmed, black hat, just like the one she has been rocking onstage during her Formation Tour this spring. It was her fingerprint-distinct take on menswear and was visual proof why she was selected to win this award. Beyoncé always does things her way, with her signature style flourishes, when it comes to fashion. Congrats, Bey. Beyoncé received the 2016 CFDA Fashion Icon Award from a fellow icon — fashion designer Diane von Fürstenberg. It was a moment and was almost too much fashion awesome at once. During her speech, the singer stated that fashion has always been a big part of her life, thanks to her DNA. She said, "Its effect on me actually started before I was born. Many of you guys don’t know this, but my grandmother was a seamstress. My grandparents did not have enough money, they could not afford my mother's Catholic school tuition. So my grandmother sewed clothes for the priests and the nuns and made uniforms for the students in exchange for my mother's education. She then passed this gift onto my mother and taught her how to sew." This fact about Beyoncé's family affirms why this honor isn't some fluffy, frivolous award for her. Clothes have had impact on her life for so long, from her youth through her career to her status as a celeb that any designer would kill to dress. Bey also shouted out designers, celebrating the artistry and the craftsmanship that goes into creating clothes. She gushed, "Y'all are fairy godmothers, magicians, sculptors, and sometimes even our therapists. I encourage you to not forget this power you have or to take it lightly." Leave it to Beyoncé to take a her moment and share it with and give props to others in this world. She is a class act and one of the most stylish women alive. That is why she is the CFDA 2016 Fashion Icon.